The difficulty we are faced with, as a society in the context of a ‘politics of riot’, is that meaningful dialogue to address this important question is almost impossible. How did a peaceful protest on Saturday evening escalate to the serious rioting over consecutive nights on a scale not witnessed since the ‘inner city’ riots of the 1980s? What dominates at present are vitriolic debates loaded with moral indignation that are as much about pathologising crowd action, attributing blame and denying responsibility as they are about truth and objectivity. If the political discourse is anything to go by our society is under attack from ‘outsiders’ hell bent on ‘mindless criminality’ from whom we need protection through robust policing. The spread of this ‘disorder’ to other areas such as Hackney, Peckham and Croydon is described as ‘copycat’; a notion that conveys that people are drawn into the looting and attacks not because of any meaningful processes but simply because they have seen these things going on. Another feature that is a focus of media analysis is the potentially negative role played by the Blackberry mobile phone and its unique ‘closed’ and relatively anonymizing mass messaging system. But this transition from peaceful to riotous crowds is, of course, one of the fundamental questions of crowd psychology. In addressing it over the last thirty years my colleagues and I have made some important advances in scientific understanding of how and why riots come about. Of central importance is that we know that ‘riots’ cannot be understood as an explosion of ‘mob ‘irrationality’. Nor can they be adequately explained in terms of individuals predisposed to criminality by nature of their pathological disposition. The behavior of these people in smashing up their ‘own communities’ may seem irrational to some but to the ‘rioters’ themselves these targets are highly meaningful. These meanings in turn always relate to their sense of themselves as a social group and of the illegitimacy of their relationship to others around them. In this respect it is highly meaningful that these riots began in a context of the shooting of Mark Duggan. This incident represented for many within his community the ongoing antagonistic relationship they have with the Metropolitan Police that fed into the social and psychological dynamics of the events on Saturday night. It is highly relevant that in the context of these riots people have taken the emerging opportunity to target shops selling high-end electrical goods, clothes and jewelry. In this age of austerity, such items are becoming increasingly unobtainable to ever-larger sections of the working class and it should not be surprising that some are using the riots as an opportunity to obtain them. To render crowd action as meaningful and driven to a large degree by contextual issues is not to act as an apologist for these riots. Nor is it to accept as legitimate the attacks against ordinary working people, businesses, homes and families. 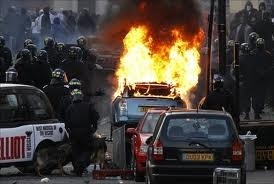 In fact our work has played an important role in developing policing methods that prevent riots from happening. Our science also underpins many of the recent recommendations made by the HMIC following the death of Ian Tomlinson during the G20 protests. These approaches do not rely on the reactive use of force. Instead they prioritize proactive interventions based upon dialogue as a means for building and maintaining police legitimacy. Our argument then is that to render the riots meaningless is actually to deny the opportunity that we must take to understand them if we are to take the appropriate measures that will prevent them in the future.